View of “Matthias Bitzer: Immaculate Cloud,” 2016. 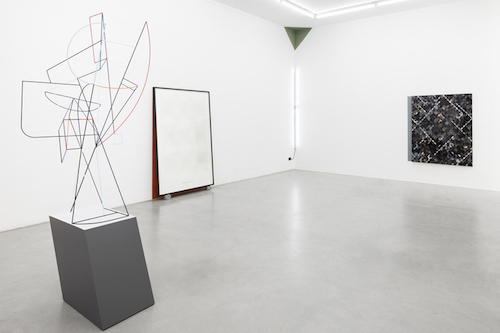 For his fourth solo show at the gallery, Matthias Bitzer has produced a strongly evocative and inventively fresh installation. The image of the immaculate cloud that gives the exhibition its title refers to the spatial and temporal fluctuations that one perceives in this kaleidoscopic show. What emerges most clearly here is the versatility and breadth of the artist’s research, characterized by the destructuring and dematerialization of communicative codes and their tools, resulting in a new construction of signification. In the distortion, contraction, and use of different materials and mediums—acrylic, ink, canvas, paper, glass, neon, wood, steel, photography, collage—Bitzer imbues his work with a vocabulary both imagined and real, the deciphering of which requires unusual involvement on the part of the viewer. For example, Matter of Anticipation, 2016, unfolds in a corner of the gallery and follows the architecture of the space––almost as if it were an open book––made up of images and flexible membranes. Intentionally developed to move beyond oppositional categories—such as figurative or abstract, pictorial or three-dimensional, narrative or decorative—Bitzer’s work instead can be defined as a catalyst of languages, visions, and iconographies in a fluid amalgam that annuls any conventional references. The outcome is the formation of an experience that is equally visual and physical. He accomplishes this by engaging us in a vast panorama of the present, whose fluidity elapses into a memory that seems to be re-created through our own observation and passage in real time. Immersing us in this cloud that records, preserves, and transmits images and events, Bitzer’s work seems to aim to re-create an experience we have on a daily basis: storing and sharing the digital equivalent of the present in the immateriality of the technological “cloud” and, moreover, adopting an explicit lexical correspondence with it, precisely as with the show’s title.